You have seen him in yard sales, on Ebay, and trade shows. You might even remember him from a store display. Yes, its the Carling "Holiday Man" ! 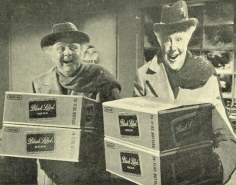 The Holiday Man first appeared for Carling in 1950. 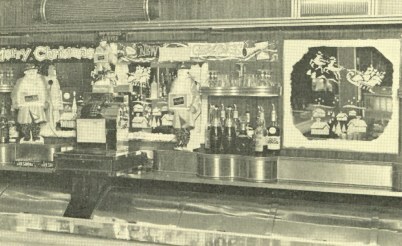 Carling was the first United States brewer to heavily promote beer as a beverage to bring home for the holidays. And guess what.......it worked ! 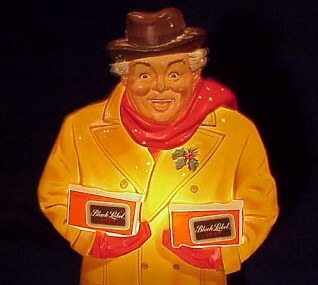 The first "Holiday Man" was an artist's version that was used in point-of-sale material during the Christmas holidays. The plastic and cardboard signs and stand-ups used won Carling two national advertising awards for excellence and effectiveness. 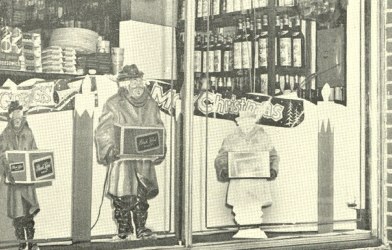 The Carling team that created the campaign pose with the "Holiday Man"
The advertising pieces were simple plastic and cardboard standup signs, usually about two feet tall, with a jolly looking man carrying either a case or a couple of six pack of Carling Black Label. There were other editions produced with him carrying both Carling Black Label and Carling's Red Cap Ale, and others with him toting Carling's Red Cap Ale only. 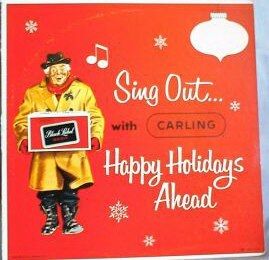 These simple advertising pieces were used for over eleven years before Carling took the next step. . Each year, Carling saw record holiday sales. 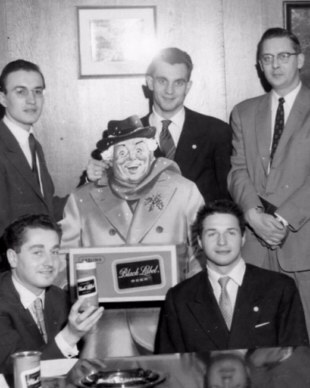 In 1961, Carling used the Holiday Man in television commercials for the first time. Portrayed by actor-model Tom Reynolds from New York, The Holiday Man appeared in three television commercials. The spots were 60 seconds, 30 seconds, and 10 seconds each. 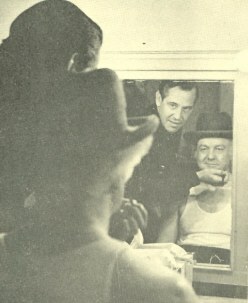 Tom Reynolds was discovered by Carling's national advertising agency of Lang, Fisher & Stashower, Inc. 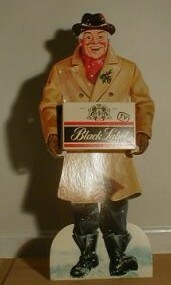 The "live" Holiday Man, Tom Reynolds, stands in front of the cardboard life-size stand up of himself. 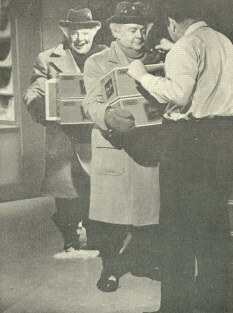 The first commercial filmed, a 60-second spot, started with Tom outside a carryout store carrying a case of Carling Black Label. 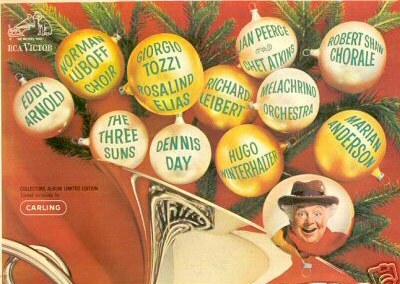 He proclaimed, " It's the season for happy holiday smiles". 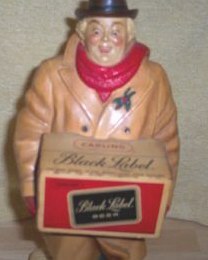 The Holiday Man goes on to say that he is smiling about the refreshing thought of Carling Black Label Beer. After a suggestion by him to buy it by the case, the scene switches to a party scene and to a close up shot of Carling Black Label being poured into a glass. Meanwhile, Tom invites consumers to share in the good time of the holiday season with friends by "serving them a tall , cool glass of light'n lively Carling Black Label - the quality beer sold coast to coast at the popular price. "It's such a delightful way to enjoy the warm friendly spirit of the season". Of course, Mabel was there at the end with the famous whistle and wink. "Mabel, Black Label......Carling Black Label Beer". The 30 second, and 10 second spots followed the same theme. 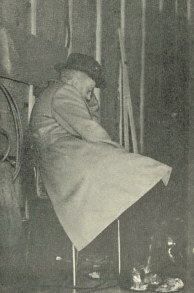 "Making Black Label commercials wears me out!" The Holiday Man commercials and P.O.S. were used from Thanksgiving through New Years. 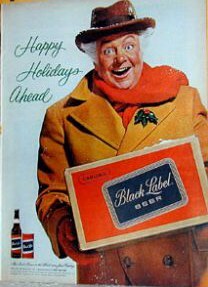 While not as famous as "Mabel", The Holiday Man holds a special place in Carling's advertising history. 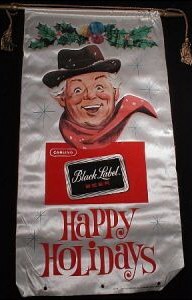 Hey Mabel Black Label.Com !